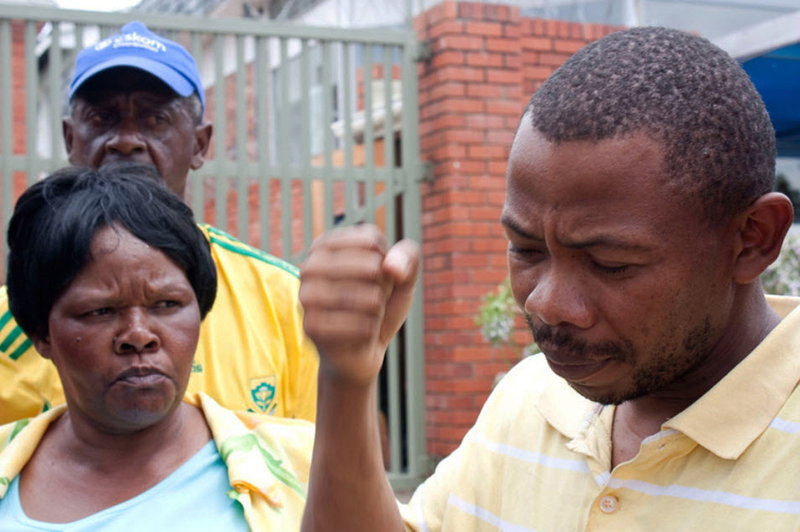 Like so many activists, service delivery protesters and people fighting for basic human rights in impoverished communities across South Africa, founder of the Unemployed People’s Movement Ayanda Kota is harassed, arrested and suppressed in the hope that he’ll shut up or go away. But Kota says he’s going nowhere, and will fight for the rights of the poor and unemployed until the bitter end. By MANDY DE WAAL. As poverty and unemployment activist Ayanda Kota speaks to Daily Maverick from Grahamstown, his words echo King’s sentiment as they crackle across the unsteady mobile connection. Founder of the Unemployed Movement’s People (UPM), Kota is heading out of town and into a nearby rural area to mobilise people to rise up against poverty. A people’s champion who is much maligned by the local ruling party and ANCYL for being a “traitor” – for daring to criticise – Kota accedes he could have chosen an easier path. “Yes we could have chosen another road. A path of expensive whisky or building a R4-million rand house and getting fat on tenders… but we chose this road. This isn’t a road for sprinters, it is a long road when it comes to the question of fighting for our humanity,” Kota says matter-of-factly. Kota is not being overly dramatic. He’s merely stating the truth. In a political environment where party loyalty is everything, the leader of Grahamstown’s populist poverty movement is an unapologetic apostate. He’s the man who led a delegation of protestors to the Makana Municipality offices in the middle of that Eastern Cape town, and dumped buckets of human faeces at the entrance of ineffective local government. The point he made was as newsworthy and politically pointed, as it was fetid. Township people were fed up with using a bucket system to deal with their effluence. “Marches very quickly become normalised, but the Unemployed People’s Movement has been very effective in becoming noticed in different ways,” adds Pithouse, who explains that grass roots organisations often arrive with a splash but disappear soon after being repressed or because locals lose interest. “It does take a special kind of political skill to keep the pressure up and to keep people energised and interested,” he says. Kota’s ability to capture the hearts and minds of Grahamstown’s poor, and his ability to keep consistent pressure on local government and party political structures isn’t making life any easier for him. The UPM founder often receives death threats and is harassed by the police, and last month he was arrested and brutalised. The charge against him? Not returning a couple of books. Veteran journalist Mike Loewe of Grahamstown writes how Kota was charged by Rhodes University sociology lecturer Dr Claudia Martinez-Mullen of allegedly stealing her inscribed copies of The Communist Manifesto, The Antonio Gramsci Reader: Selected Writings 1916-1935 and The Marx-Engels Reader. The charges were first made against Kota last August, but earlier this year when the activist was called to the local police station and voluntarily made his way there, he was beaten by six police officers. Pithouse, who accompanied Kota to the station, says that the investigating officer grabbed Kota who then raised his arm in defence. The police then started beating and kicking Kota until he was on the ground. The attack took place in front of Kota’s six-year-old son who was distraught and became hysterical when he saw his father being attacked. Kota’s pants were then pulled down to his knees as the investigating officer belittled him by saying: “Look who is the newsmaker of the year now!” Kota was named Grocott’s Mail newsmaker of the year last year for frequently dominating the news in 2011. “Ayanda has been under considerable pressure for a long time. He has been harassed by the police, his family has been harassed by the police, and he has been publicly threatened by the ANC Youth League on occasion. This has extended to death threats. The ANCYL’s hostility to Ayanda is long-standing,” says Pithouse. Pithouse explains that a lot of the animosity that local government and political types feel towards the likes of Kota has to do with identity. “People who are in the ANC or in local government want to see themselves as people who are doing the right thing, and fulfilling the aspirations of the struggle that brought them to power. It is very uncomfortable when they have to confront others who say that they are similar to people who were in power in the past,” he says. Psychologically it becomes much easier to employ conspiracy theories, to undermine the source of the inconvenient truth or to try and shut the source of your embarrassment up. The problem with Kota is that he’s not shutting up and he’s not going away. He’s a long distance runner and it appears his running the road he’s chosen to the bitter end. “Our leaders become the very same cogs of those same machines that did bad things to them. They have become the nuts and bolts of the machine that is oppressing us today. These are the very same leaders that during the colonial struggle embodied the ethics, values and the content of the struggle. But today they are on the other side. They are telling us to go to our graves because the days of struggling are over. They say that if we continue to demonstrate we will be shot at, we will be arrested by the very same leaders who liberated us yesterday,” says Kota. As township people fight for daily survival in Grahamstown, Kota says that for the most part, members of the ANC are afforded jobs, tenders and a place at the trough. This as township people struggle daily with crumbling houses, corruption, water taps that don’t work, the degrading bucket system, increased food prices, hunger, unemployment and the unending disappointment of political promises that fail to amount to anything. Marxist books row divides the comrades on IOL. South Africa – The reign of thugs on AllAfrica. Julius Malema is a Demagogue by Ayanda Kota on Abahlali baseMjondolo. ANC Centenary: A Display of Elite Power by Ayanda Kota on Abahlali baseMjondolo. Watch UPM’s bucket protest in Grahamstown on YouTube. Watch Ayanda Kota speaking about being unemployed on YouTube. Watch Ayanda Kota debate Floyd Shivambu on YouTube. Photo: Ayanda Kota – the people’s hero.